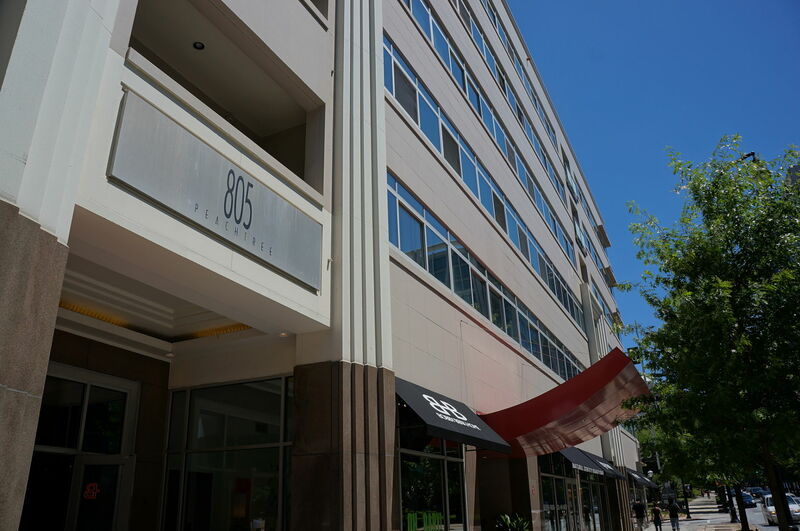 805 peachtree was originally built as an office building in 1951 and was commonly known as the Social Security Administration building after its largest tenant. In 2000, the building was renovated and converted into residential lofts. The conversion was designed by architects Stang & Nedow, who also designed Ponce Springs lofts in Midtown, 335 West Ponce lofts in Decatur, Centennial Park West in Downtown and Castleberry Point in Castleberry Hill. The conversion blends European contemporary style with art deco, a nod to the building's roots. The building is 6 stories high with 114 loft units, comprising of 30 different floor plans in a manner in which there is only one version per floor. The units themselves are authentic loft style with high ceilings and exposed beams. Finishes include hardwood flooring, designer lighting and upscale kitchens with SieMatic cabinetry, stainless steel appliances and solid-surface countertops. Amenities include everything you would expect, including 24 hour concierge, City Club, heated/cooled pool with grill, fitness center and guest suites. The location is unbeatable, in the heart of Midtown Atlanta just steps from dining, shopping and entertainment, just down the street from Piedmont Park and up the street from the fabulous Fox Theatre, and equidistant between the North Avenue and Midtown MARTA stations.